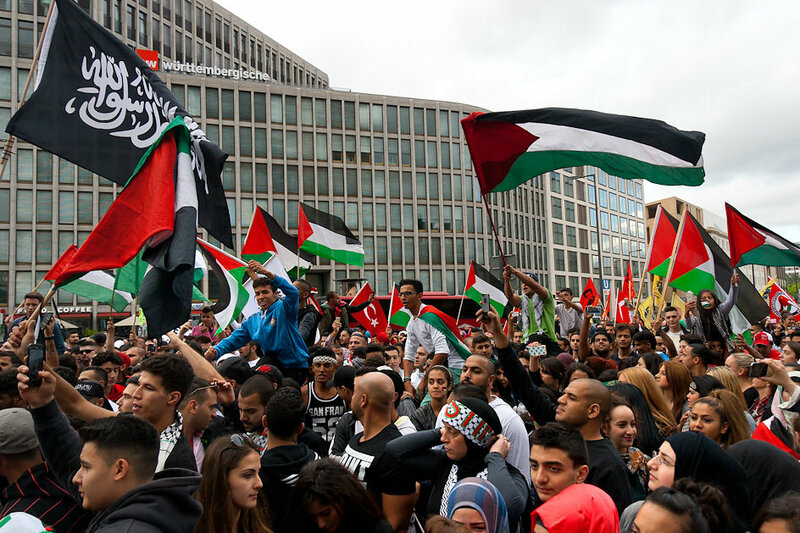 Violence, hate speech, self-immolation: the Middle East conflict has reached Germany, with observers worrying that riots during recent Gaza demonstrations are an expression of deeply rooted anti-Semitism. EURACTIV Germany reports. In several German cities, thousands of people have taken to the streets to demonstrate against Israel’s military action on the Gaza Strip. In Hannover, Göttingen and Essen, protestors attacked pro-Israeli counter demonstrators and anti-Semitic slogans were chanted at rallies. The Central Council of Jews in Germany was “shocked” at the “explosion of angry and potentially violent anti-Semitism”. One would “never have considered it possible that anti-Semitic shouts would be heard on German streets and chanted in a most primitive way”, said the Central Council’s president Dieter Graumann. Particularly in the capital city, such occurrences are quite frequent these days. German police did not ban the chant until Tuesday (22 July). Police will intervene if this condition is violated, a police spokesman said in Berlin. On Monday (21 July) night, a man attempted to light himself on fire in front of the Israeli Embassy. An Imam in the Al-Nur Mosque in Berlin’s Neukölln district called Jews “butchers of the prophet” last weekend. On Berlin’s main boulevard Unter den Linden, a man wearing a Jewish Kippa was attacked by pro-Palestinian demonstrators. Individual demonstrators shouted, “f—ing Jews, we will get you”. The man was able to escape his attackers, reaching the protection of security guards and police. German Chancellor Angela Merkel denounced the anti-Semitic statements, demonstrations and attacks, which have taken place over the last few days. They are an “attack on freedom and tolerance”, Georg Streiter, a spokesman for Merkel, said on Wednesday (23 July) in Berlin. “Nothing, including the dramatic military confrontation in Gaza, justifies such activities here in Europe”, Foreign Minister Frank-Walter Steinmeier said in a joint statement with his colleagues, French Foreign Minister Laurent Fabius and Italian Foreign Minister Federica Mogherini. German Justice Minister Heiko Maas also rebuked the recent riots. “Anti-Semitic hate speech is absolutely intolerable and is not excused by anything”, Maas said in Berlin. Such aggressive and open hate towards Jews has not existed on German streets since the Third Reich, explained Micha Brumlik, Senior Professor at the Center for Jewish Studies, in a statement for euractiv.de. “These anti-Semitic outbreaks were not caused by the Gaza war. More and more young migrants from primarily Muslim countries are living in France as well as in Germany. Often they are not completely integrated into society and now they are expressing their general anger”, said Brumlik. But by saying this, the historian does not want to belittle hate against Jews in Germany, he said. “Anti-Semitic attitudes are deeply anchored in Germany. The current Gaza conflict is only a justifiable opportunity to express animosity toward Jews,” Brumlik argued, pointing out surveys indicating that 20% of Germans have anti-Semitic feelings. Even right-wing extremists and radical left groups are using the Gaza conflict as an opportunity to mobilise anti-Semitic attitudes, Brumlik said. That includes Germany’s Left Party, he added. Its youth group in North Rhine-Westphalia organised a peace demonstration in Essen. Around 1,000 people protested, initially peacefully, against Israel’s bombing of the Gaza Strip. But afterwards a group of around 200 demonstrators attacked counter-protesters, in opposition of anti-Semitism. According to police reports, bottles and other objects were thrown during the struggle. “Security at Jewish sites had to be reinforced ahead of an event partially initiated by leftists. Anti-Semitic slogans were chanted during and after such a demonstration. The Essen Synagogue was a proclaimed target of anti-Israeli participants at this demonstration. Bottles and stones were thrown at pro-Israeli demonstrators. I am deeply ashamed because of all of this”, explained federal managing director of the Left Party Matthias Höhn. Brumlik also criticised the way German police forces handled the Gaza protests. “Many policemen have acted foolishly so far.” Apparently they themselves were surprised at the turn taken by demonstrations, said Brumlik. The judiciary also seems overwhelmed, he indicated. The Berlin prosecutor’s office failed to categorise the expression “Jewish pig”, shouted at demonstrations last week, an incitement against the Jewish population. Instead, the slur was simply considered an insult. “That shows how unfamiliar many lawyers are with the context”, said Brumlik. And the professor at the Center for Jewish Studies said the anti-Semitic aggressions could continue to intensify. A demonstration which will take place this Friday (25 July) on the Iranian “al-Quds Day” is just another example, he said. Worldwide, demonstrators gather annually on this day to call for the liberation of Jerusalem from Israel. Some German Jews, however, worry that such fears are driven by issues other than Judeophobia. In a radio-interview for Deutschlandfunk, Rolf Verleger, a former member of the Central Council of Jews, criticised community representatives for declaring every criticism of Israel as ‘anti-Semitic’. “I share the view of Foreign Minister Frank-Walter Steinmeier that in Europe, there should be a right to demonstrate, but (there) no place for anti-Semitism,“ Raed Saleh, floor leader for the Social Democrats, in Berlin’s city-state parliament said on Wednesday (23 July) to the Deutsche Presse Agentur (dpa). On 16 July European Union leaders called on Israelis and Palestinians to end violence and said they welcomed efforts, particularly from Egypt, to broker a cease-fire following more than a week of warfare. The leaders, meeting in Brussels, urged both sides to "de-escalate the situation, to end the violence, to end the suffering of the civilian populations notably by allowing access to humanitarian assistance, and return to calm". In a statement, the EU leaders welcomed Egypt's efforts to mediate and called on the Islamic Hamas, which rules Gaza, to agree to a cease-fire. On what happened recently about mass murdering that Israel commit to Palestinian Civilians mostly children – don’t wonder me their own made awful Situation ! At 1. point the Hamas said:” Israel commit crimes against humanity ” even if i don’t like the Hamas either as most don’t – on this point objectively seen – I agree with them ! A great deal of nonsense is being talked by people that should know better. The killing by Israel of large numbers of Gaza civilians plus the destruction of Gazan infrastructure (much of it paid for by the EU) plus the settlement building programme plus……has led to these demos. The slogans shouted at them are stupid, counter productive and immoral. However, the anger is real and understandable. Targeting EU citizens who are Jewish is, likewise stupid, unfair and counter-productive. Many European Jews oppose the polices of the Israeli state towards the Palestinians. Targeting EU Jewish citizens is no different to targeting me over the use of drones by the USA to murder people in Pakistan (which I think is evil) because I’m nominally Christian and the USA is nominally a Christian state. That said, the time has come for the EU to distance itself from Israel. The country has little interest in engaging in peace talks that produce results and clearly believes that might is right. Israel treats the Palestinians like a dog – it beats it on a regular basis and then expresses surprise when sometimes the dog bites back (& uses this as further justification for beating). In his book the Quiet American, Graham Greene observed that there is no equivalence between those with guns and those without. The “interaction” between Israel and what is left of Palestine shows this to be true. EU interactions with Israel have made us part “owner” of the problems caused by Israel and led to the protests that we now see. it is time we stopped being any sort of owner of problems caused by Israeli intransigence – time to cut all ties, economic and political, with Israel. I agree with you Mr Parr ! It’s not about the Jews and of course it’s stupid targeting this people ! It’s merely the “Bombing Order” of Netanjahu ! I feel if they are threat hen as outsiders even higly surpressed by Israel year after year ! But who of the Council of the E.U. or the U.S.A. tell Him to stop theses massacres all the time ? It may be possible If that continues that way then I fears there will be more and more Palestinians from lost families joining such groupings because they already cannot defense themselves and have nothing more “to lose” ! I want to note that Israel got tons of U.S. armaments to erase Palastina or Gaza or whatever they like to destroy – contrary to the Oppositions who have Only rockets ( No clue how they are getting them) ! The only way is Peace between Palestinians and Jews and unite their territories again! A lot of failed/wrong decisions was committed after the WW2 which i don’t want to mention ! So, thousands demonstrate against the massacre of civilians by Israel (fact) and this allegedly manifests anti-semitic attitudes? Amazing. I think it’s really time to get over feelings of guilt for what happened 60 years ago and tell Israel to comply with the rules of the game. So I guess the so called people of Palestine, or Hamas are choir boys and they haven’t killed one iota of human life, including using homes and businesses for their tunnels and to launch bombs? They haven’t abused and killed hundreds of Palestinian children as bombs or to dig their tunnels? The Palestinian Mufti did not collaborate and form a pact with the 3rd Reich and Hitler to exterminate Jews. The Ottoman Islamic empire of Turkey did not commit mass genocide on Armenian Christians. Can you people understand, this is not just about Israel and the Jews. This is about Islamic terrorism. Do you honestly think that if Israel gave Hamas that strip of land they want, it would end there? Are you kidding me? One only needs to see what Islamic extremists like Hamas, the Muslim Brotherhood, Isis, Jihadist are doing around the world. The whole of Europe is becoming Eurostan or Eurabia. In the US alone, there are 35 known Jihadist terrorist camps. For heaven sake, wake up and smell the coffee before it’s to late, and stop thinking this is solely about little Israel, Palestine and the Jews. One day, you will be saluting the Islamic flag and bowing to a Caliphate one world leader. You will be forced to convert to Islam or die by the sword. The gay community will be exterminated. Special needs children and adults will be exterminated. And you still think this is only about little Israel and Palestine. You are in for a rude awakening.